Serving South-Eastern Michigan. We come to your vessel. Scroll down to view descriptions of processes and procedures used in each service. Top quality products are used in all services. Including: Meguiar's or Seapower Boat Cleaner and Wax, Collinite #885 for areronautical and marine applications, 3-M Rubbing Compound, Amazon's Golden Teak Oil or Sikkens. Boat is Thoroughly Washed with a Soft Brush and Non-Wax Stripping Soap. Cockpit Area is Washed and Cleaned including Seat Cushions, Dashboard and Windows. Plexi-Glass Doors, Windows and Hatches are Cleaned with Plexi-Glass cleaner. With weekly washing, your boat can be washed and cleaned on thursday or friday and be ready for you to enjoy every weekend! Boat is Thoroughly Washed and Cleaned (outside and cockpit area). Boat is further cleaned and waxed with Seapower or Meguiar's Cleaner / Wax by Hand or Buffer as Needed. 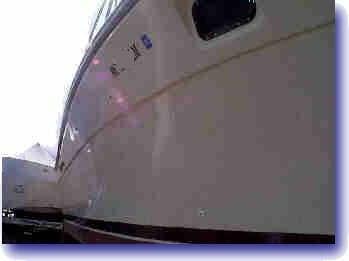 Finally the boat is polished with Collinite Fleetwax #885 Paste Wax by Hand. Boat is then Rubbed out with quality rubbing compound to remove stains and oxidation. By hand or with buffer if needed. Teak Wood is Cleaned or Sanded as Needed in Restoration Process. Teak is sealed and treated either with Oil or Sikkens at customer's request.